Recently, Senior Paintings Conservator, Amber Schabdach, conserved the original cover art for the first edition of pulp magazine Adventure, which was published in 1910. The owner of this unusual painting started reading pulp magazines almost 40 years ago, and his budding interest quickly grew into a collection of pulp magazines and eventually, the original cover art as well. “I always enjoyed the cover art, and in the early 1990's had an opportunity to buy my first two pulp paintings… from that point on, I was hooked on collecting original pulp art.” Pulp magazines reached the pinnacle of their popularity during the early 20th century. Pencil notations on the back of the canvas allude to this painting’s life in the publishing world - instructions for the printers tasked with reproducing the image for reprint. 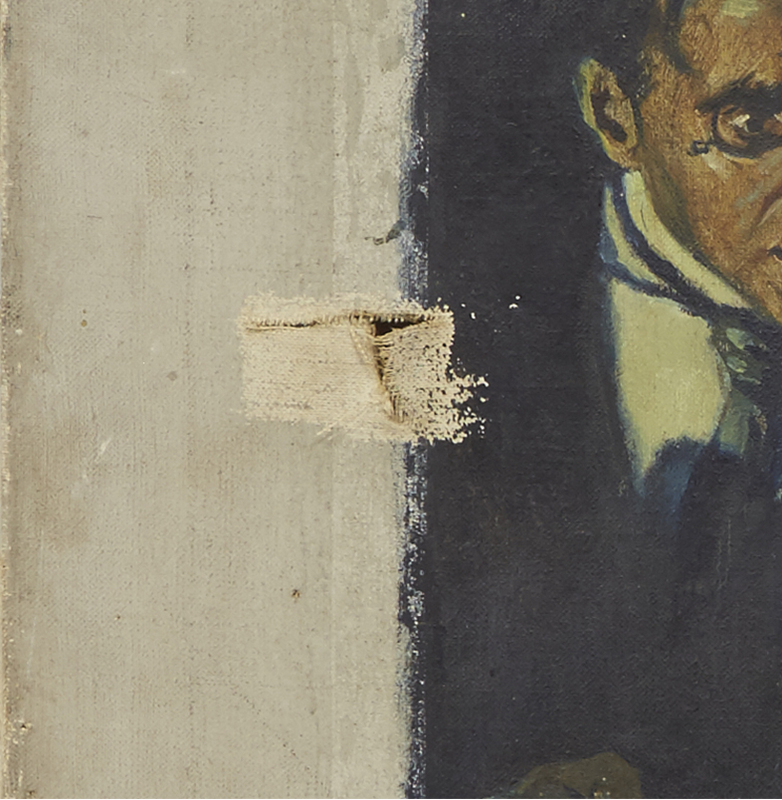 Upon examination, the painting had a few notable condition issues evident. There was a 2 inch by 1.5 inch “T” shaped tear located at the left center edge of the image. There were also other small tears along the tacking edge where the canvas was secured to the stretcher, but fortunately these did not affect the image area. Long horizontal scratches and small pinpoint areas of paint loss were visible throughout the surface as well. The painting had never been varnished, and a heavy layer of grime had settled on the paint surface. Before addressing any of the structural issues, the painting was surface cleaned to remove the layer of grime. Here, the painting is halfway through the cleaning process. Note the vertical cleaning line that is located roughly at the middle of the painting. 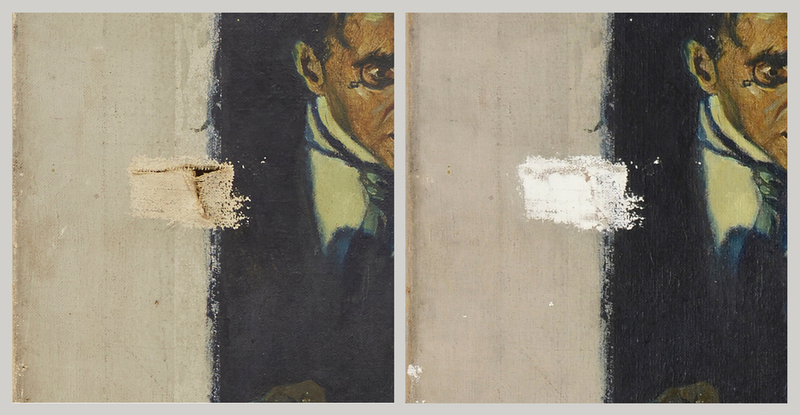 The true color of the canvas is revealed beneath the grime on the right side of the cleaning line. Additionally, the surface cleaning prepped the canvas for the tear repairs. Each tear was carefully realigned and mended using conservation grade materials to rejoin the canvas. Areas of loss were then filled with material that could be textured to emulate the original surface. Detail of the repaired “T” shaped tear, filled with conservation materials. With conservation completed, the painting was ready for custom framing. Note that the areas of loss are now camouflaged to the naked eye under the skilled inpainting. After being re-stretched to a new stretcher the painting was ready for custom framing to safely showcase and enhance the piece. One of the more noticeable characteristics of this painting is that the image does not extend to the edges of the canvas. While the image area is relatively square, its location on the canvas leaves uneven margins from the end of the image to the end of the canvas; for example, the bottom margin is about three times the size of the top margin. The unusual margins created a challenge when framing the piece, as any standard frame would assume the margins to be square. The Center’s team of custom framers was up to the task and able to create a customized frame assembly that accommodated the painting’s unique characteristics and showcased the artist’s work. Complete in its frame, the painting is returned to its appearance when it appeared on the cover of Adventure Magazine in 1910. Interested in learning more? Consider checking out the Windy City Pulp and Paper Convention, April 22-24 at The Westin Lombard Yorktown Center in Lombard, IL. Learn more here.